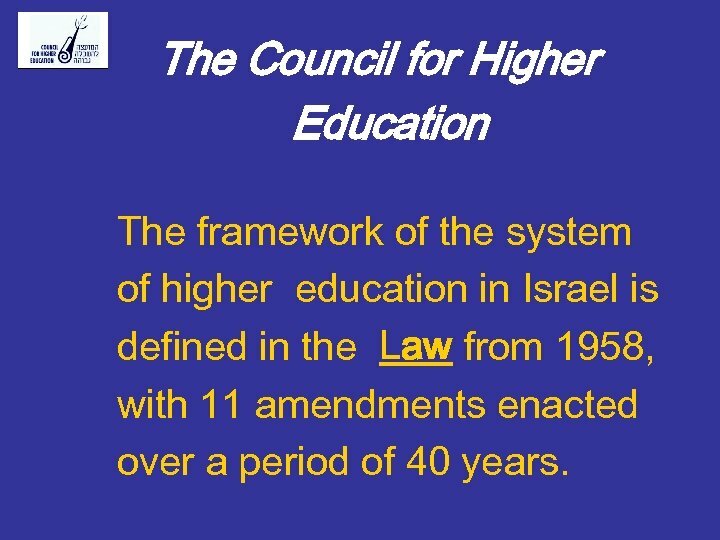 The Council for Higher Education The framework of the system of higher education in Israel is defined in the Law from 1958, with 11 amendments enacted over a period of 40 years. 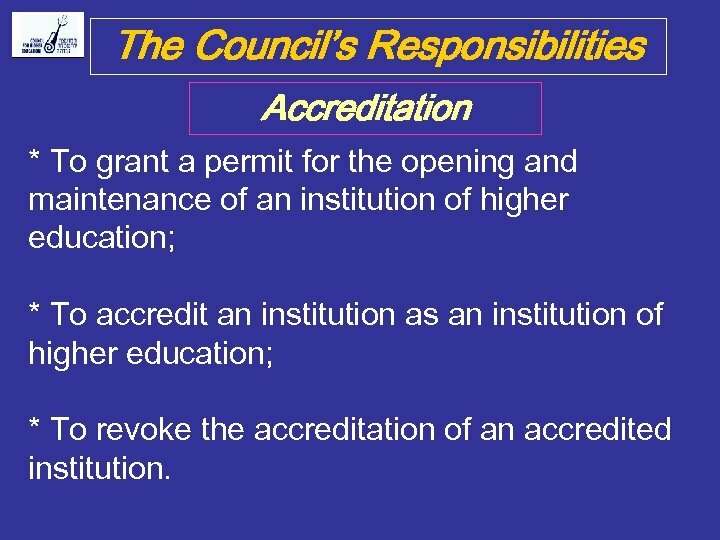 The Council’s Responsibilities Accreditation * To grant a permit for the opening and maintenance of an institution of higher education; * To accredit an institution as an institution of higher education; * To revoke the accreditation of an accredited institution. Approval of new degree and programs To authorize an accredited institution to confer an academic degree in a specific program of study. 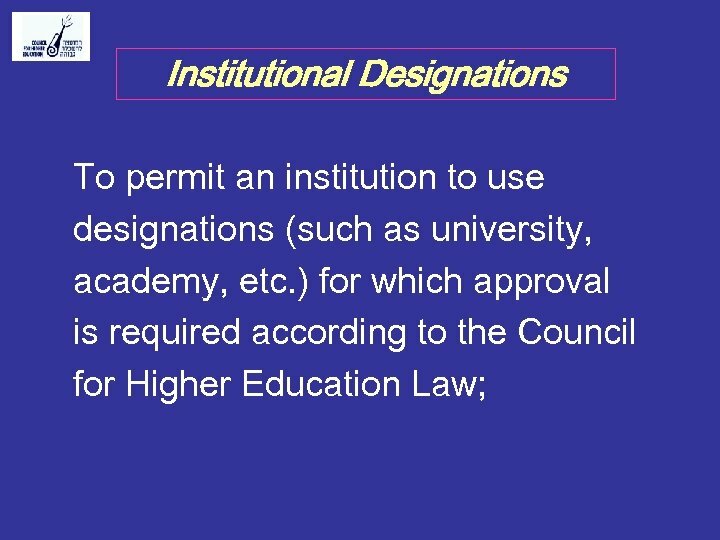 Licensing Foreign Institutions To license the branches and extensions of foreign institutions of higher education which operate in Israel. 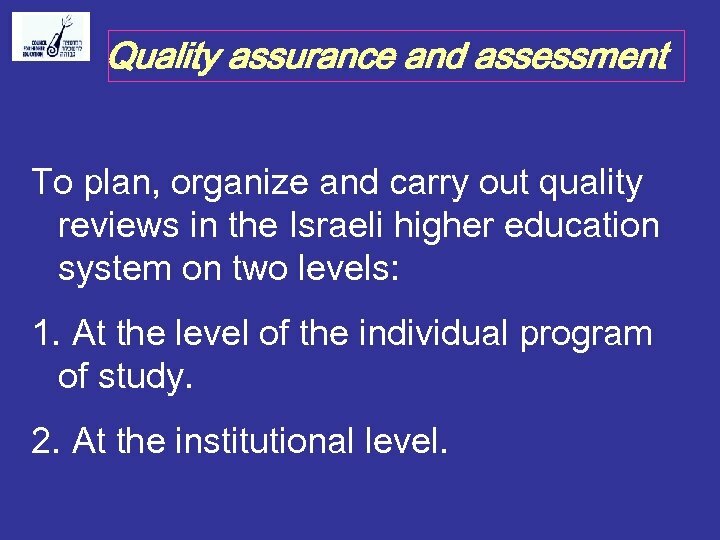 Quality assurance and assessment To plan, organize and carry out quality reviews in the Israeli higher education system on two levels: 1. At the level of the individual program of study. 2. 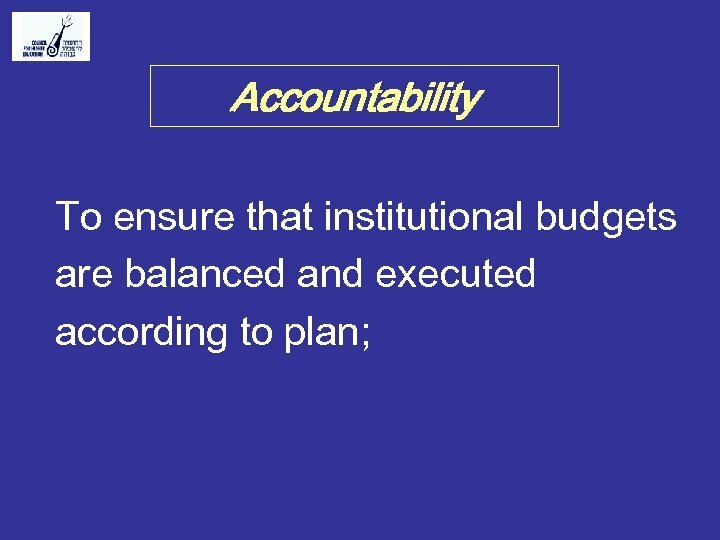 At the institutional level. 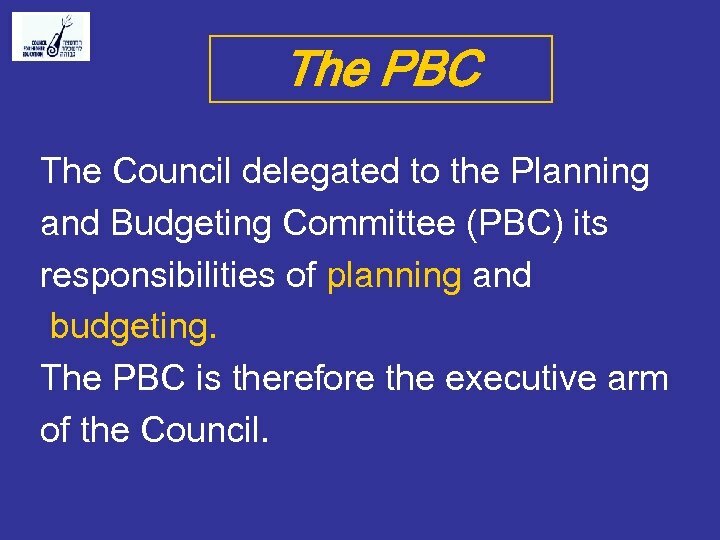 The PBC The Council delegated to the Planning and Budgeting Committee (PBC) its responsibilities of planning and budgeting. 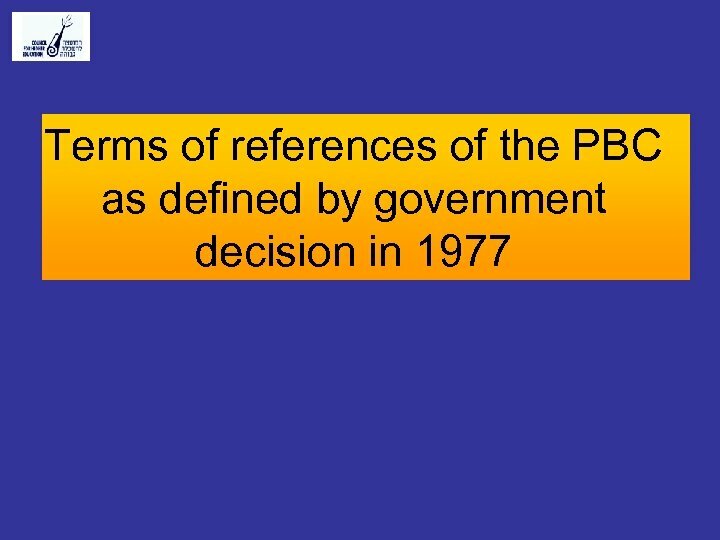 The PBC is therefore the executive arm of the Council. 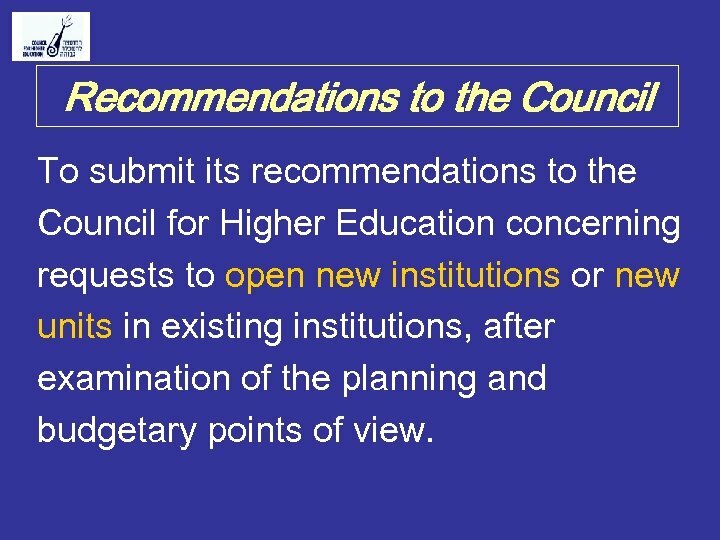 Recommendations to the Council To submit its recommendations to the Council for Higher Education concerning requests to open new institutions or new units in existing institutions, after examination of the planning and budgetary points of view. 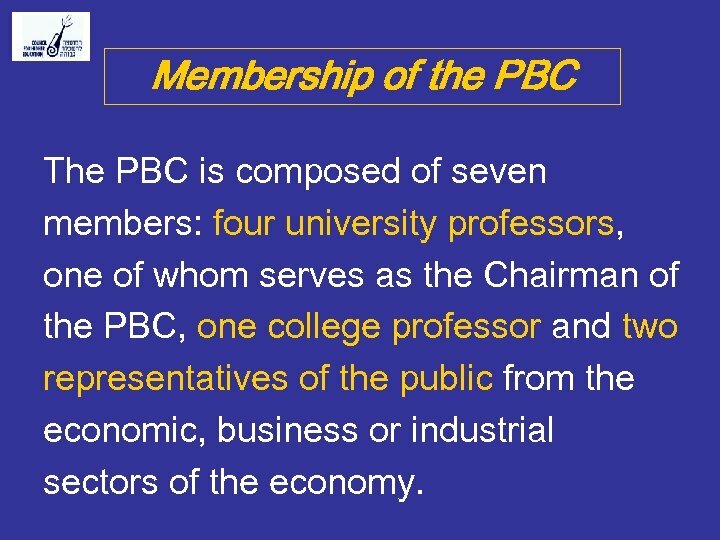 Membership of the PBC The PBC is composed of seven members: four university professors, one of whom serves as the Chairman of the PBC, one college professor and two representatives of the public from the economic, business or industrial sectors of the economy. 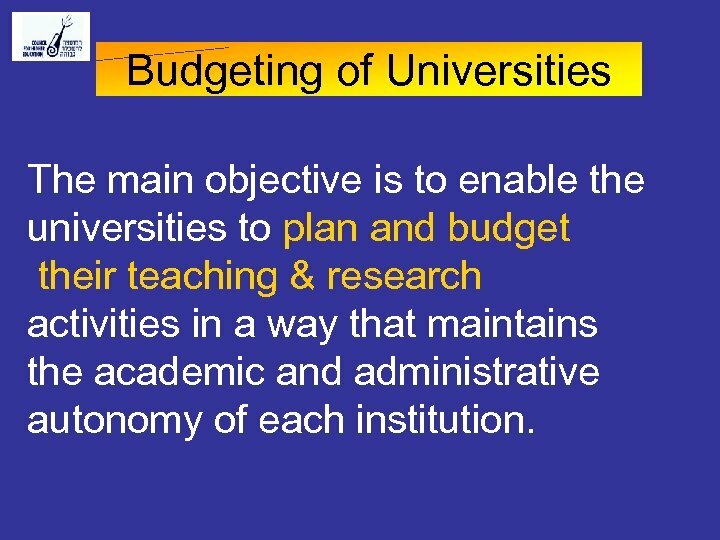 Budgeting of Universities The main objective is to enable the universities to plan and budget their teaching & research activities in a way that maintains the academic and administrative autonomy of each institution. 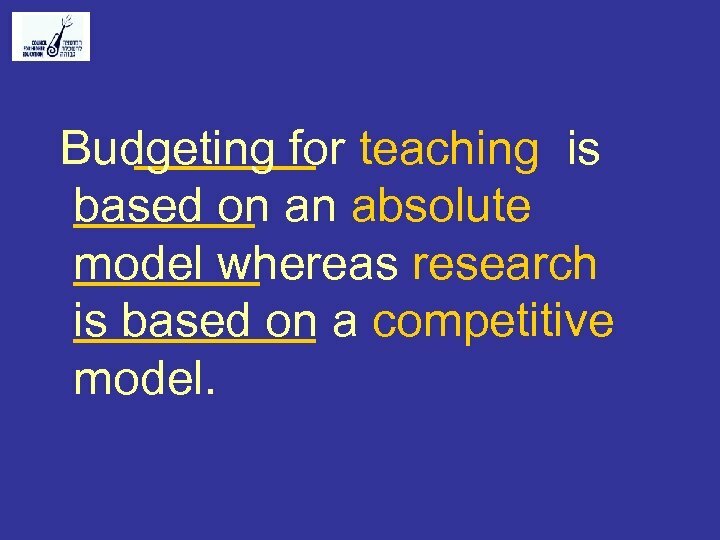 Budgeting for teaching is based on an absolute model whereas research is based on a competitive model. A. Universities B. The Open University C. Arts Academies D. Comprehensive Academic Colleges E. Academic Colleges of Engineering F. Academic Programs under University Auspices in Regional Colleges G. Academic Colleges for the Training of Teachers H. Non – Budgeted Colleges. 1. 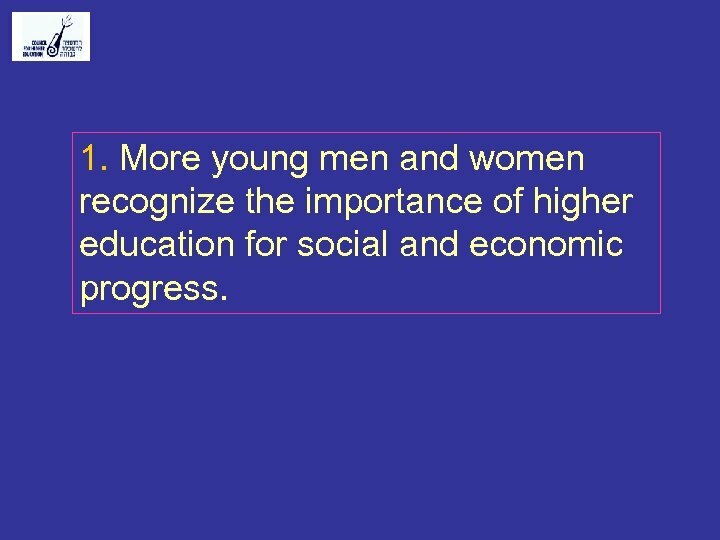 More young men and women recognize the importance of higher education for social and economic progress. 2. 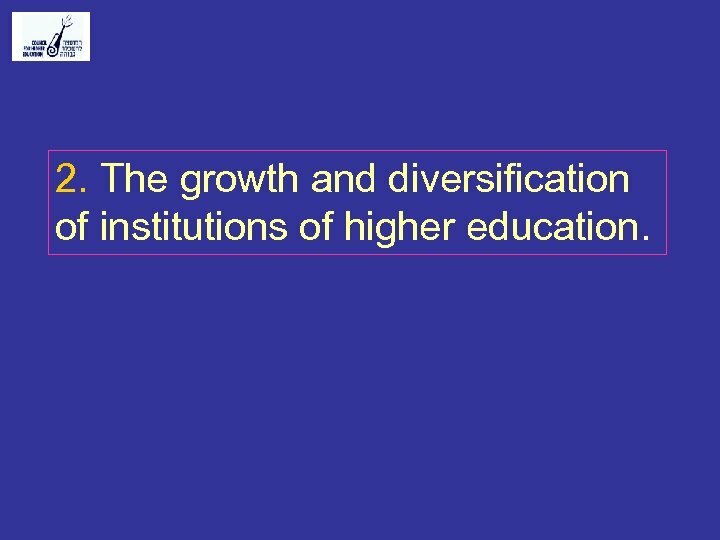 The growth and diversification of institutions of higher education. 3. 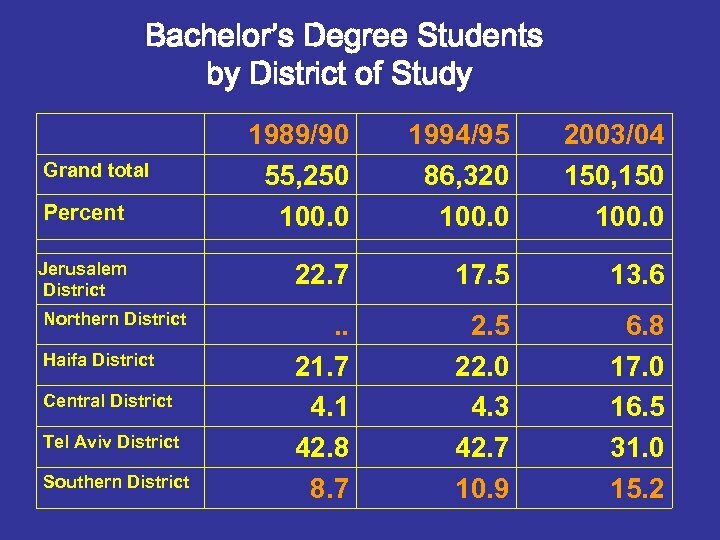 Development in various spheres of life, as well as demand, caused the institutions of higher education, new and old alike, to develop programs of study and to offer academic degrees in a wide variety of subjects, some of which were not previously offered in Israel. 4. 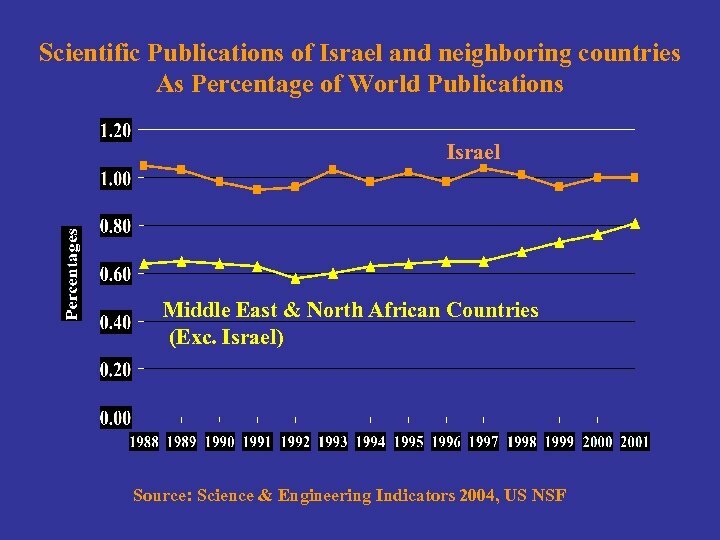 The success of Israeli industry, particularly in the fields of hi-tech, has brought the fruits of higher education to the attention of young men and women. 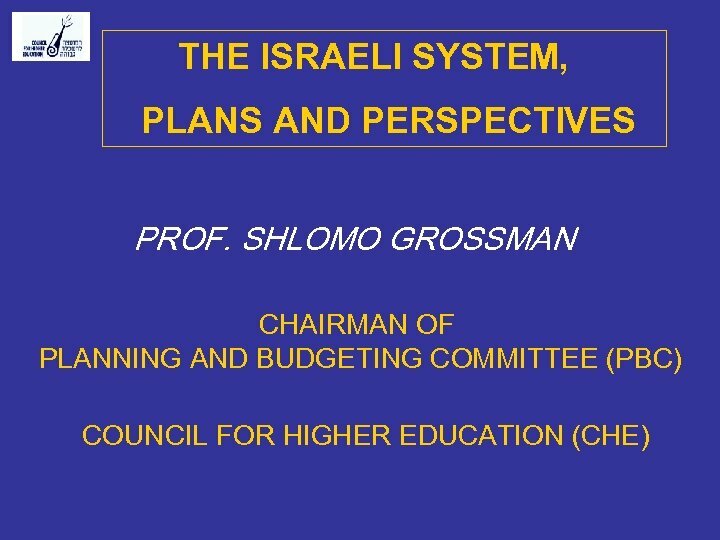 Strategy & Targets The Five-Year Plan Higher education In Israel operates within a series of five-year plans. Each plan is backed up by a five-year agreement between the PBC and the Ministry of Finance. 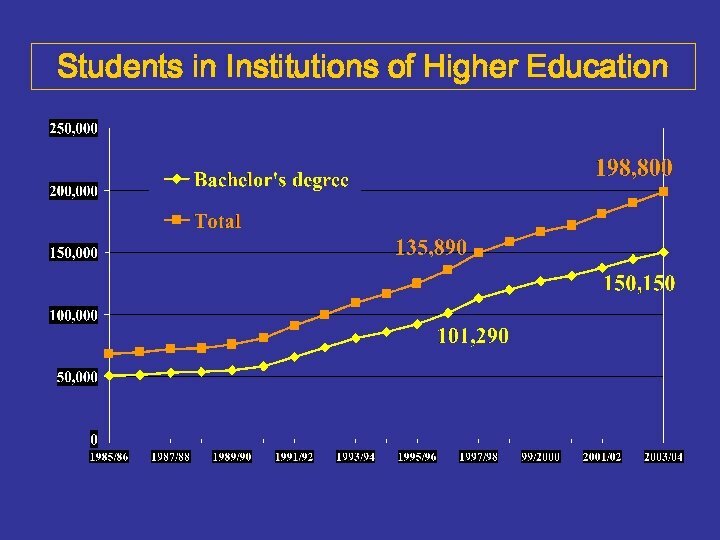 Higher education is the only public sector that has multi-year agreements with the treasury. 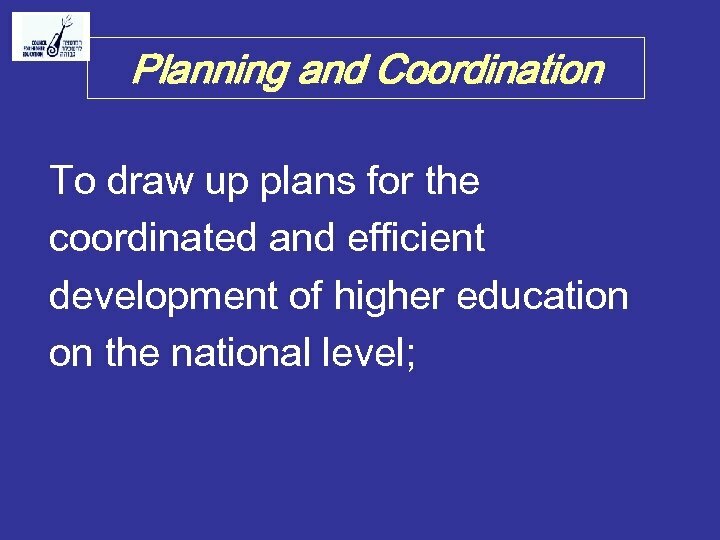 The new five-years plan (2004 -2008) has few major targets: 1. 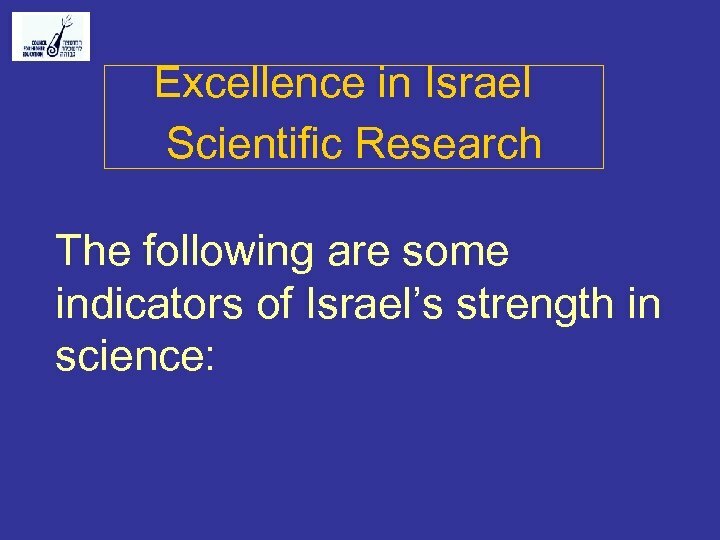 Enhancing scientific excellence. 2. 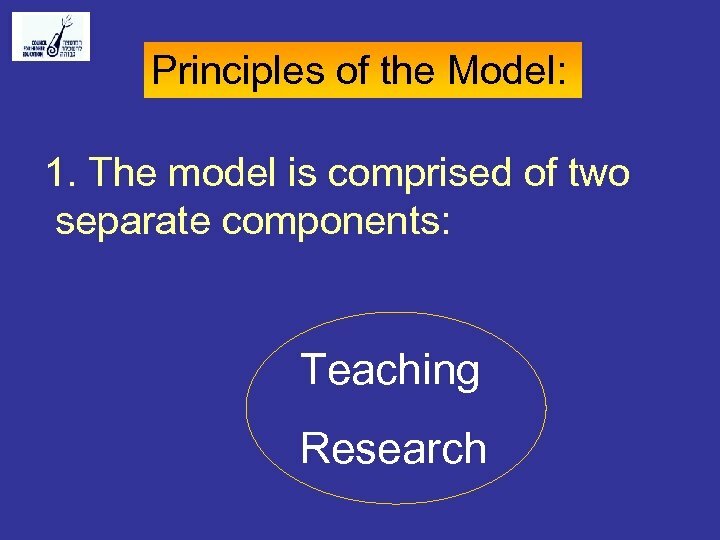 Establishing quality assurance in teaching and research. 3. 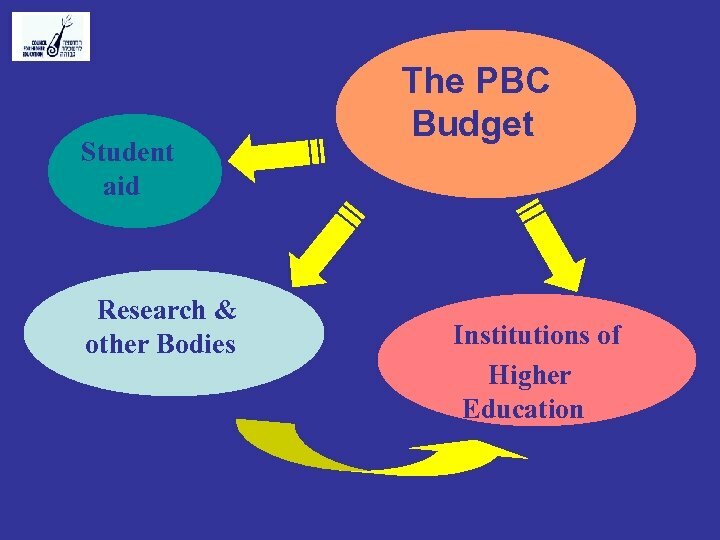 Stabilizing the finance condition of the universities. 4. 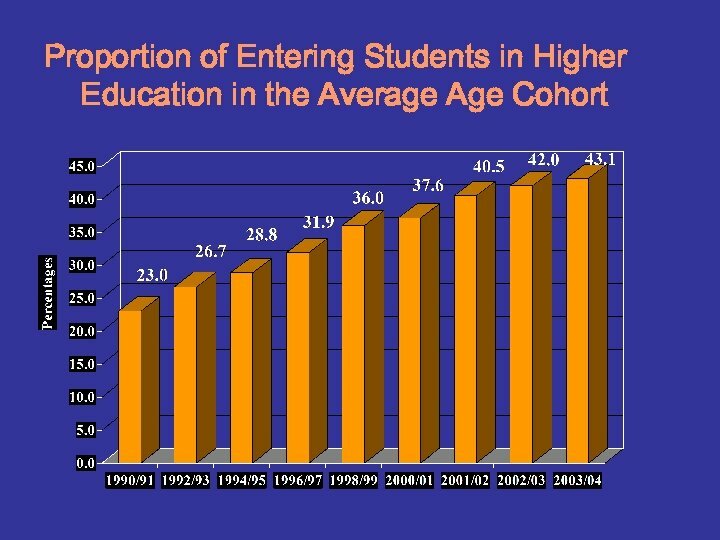 Expanding access to higher education. 1. 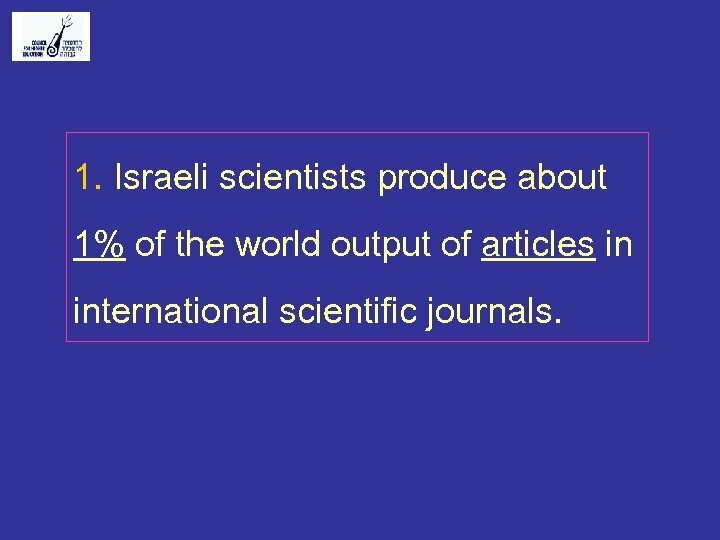 Israeli scientists produce about 1% of the world output of articles in international scientific journals. 2. 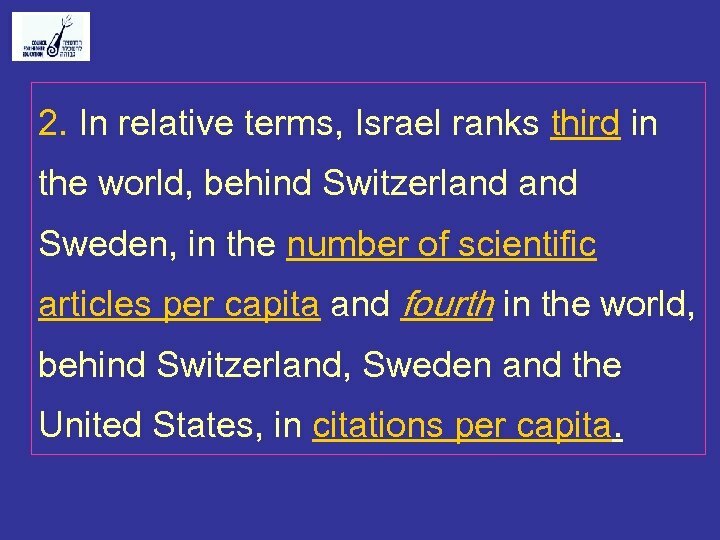 In relative terms, Israel ranks third in the world, behind Switzerland Sweden, in the number of scientific articles per capita and fourth in the world, behind Switzerland, Sweden and the United States, in citations per capita. 3. 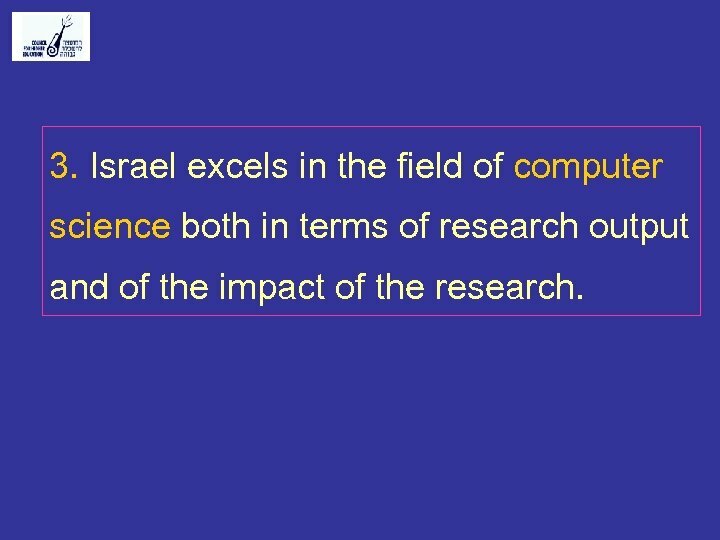 Israel excels in the field of computer science both in terms of research output and of the impact of the research. 4. 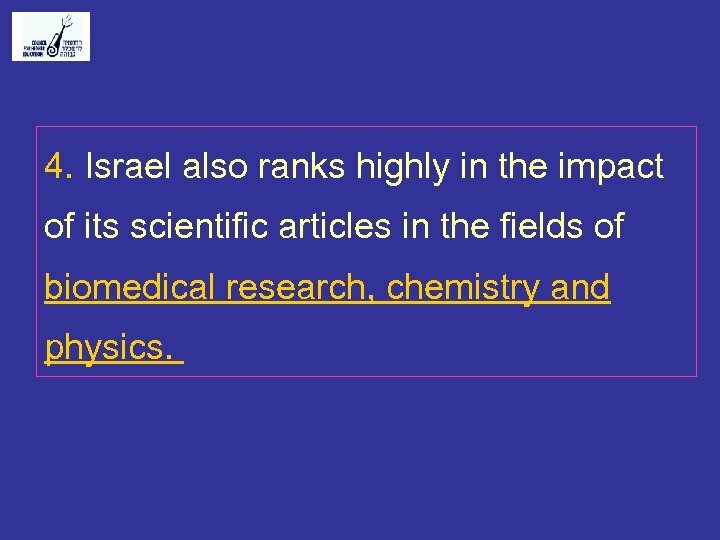 Israel also ranks highly in the impact of its scientific articles in the fields of biomedical research, chemistry and physics. 5. 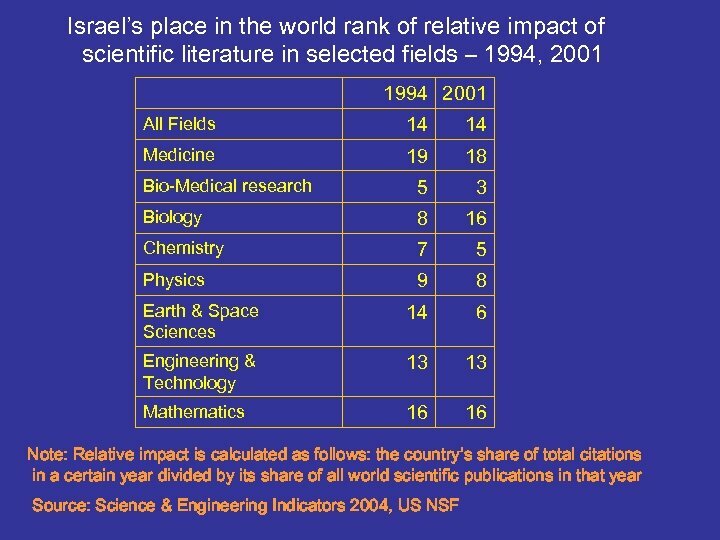 A major feature of Israel’s scientific research is its international character. 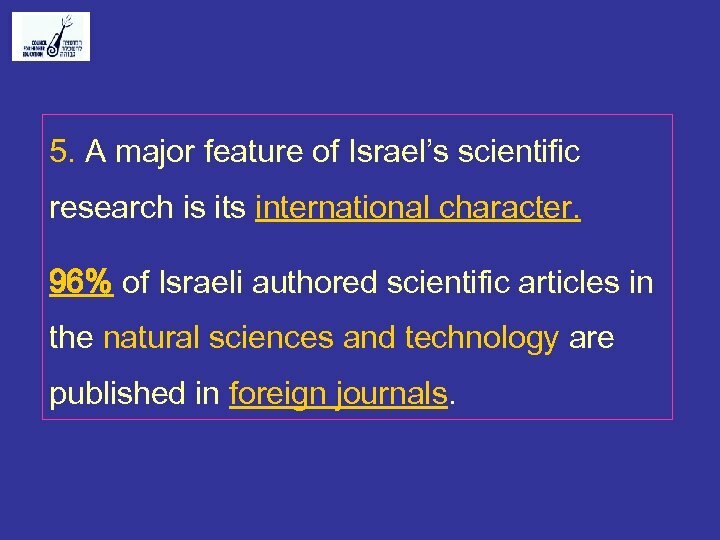 96% of Israeli authored scientific articles in the natural sciences and technology are published in foreign journals. 6. 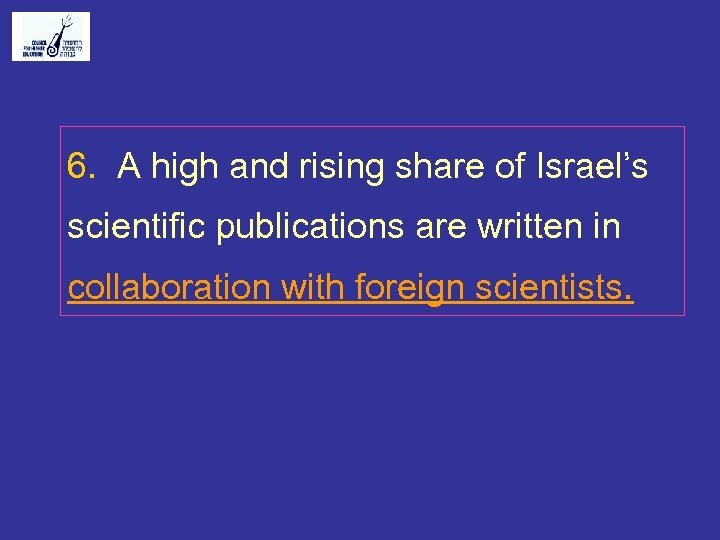 A high and rising share of Israel’s scientific publications are written in collaboration with foreign scientists. 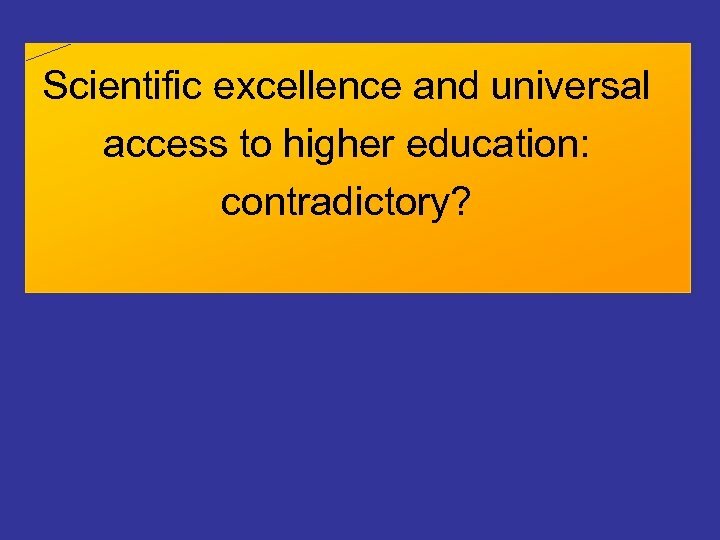 Scientific excellence and universal access to higher education: contradictory? 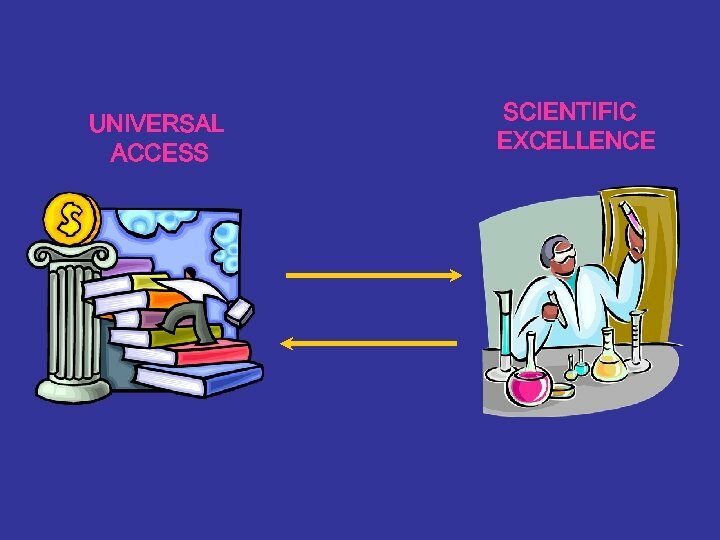 Selective access is changing and progressing toward universal access and the monolithic system is being replaced by a differential system, made up of institutions with different missions to respond to the changing needs of the economy and to the different aspirations of the students. 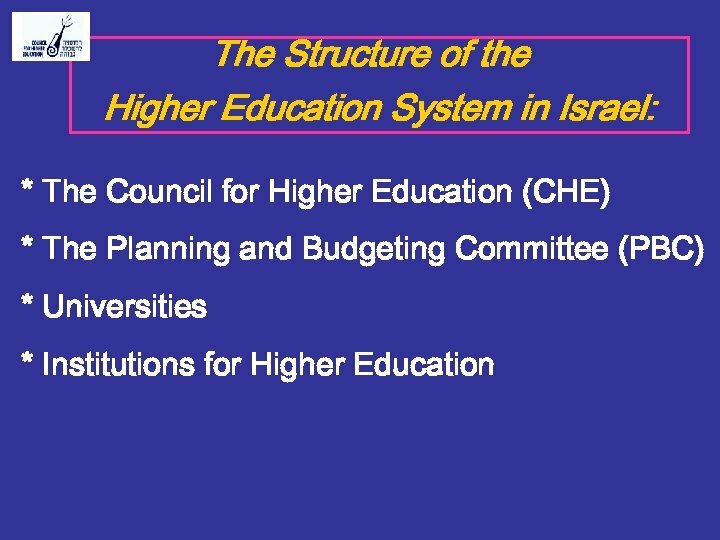 Israel’s system of higher education has two sectors, with different tasks and missions: a. 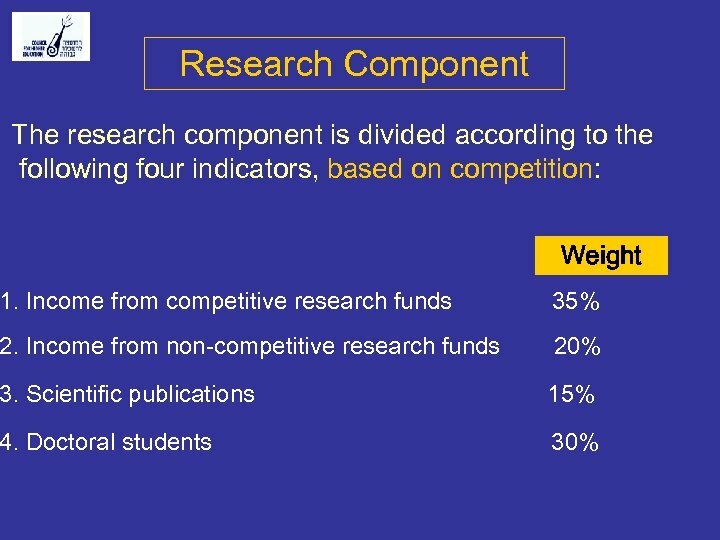 Universities that combine research and teaching. b. 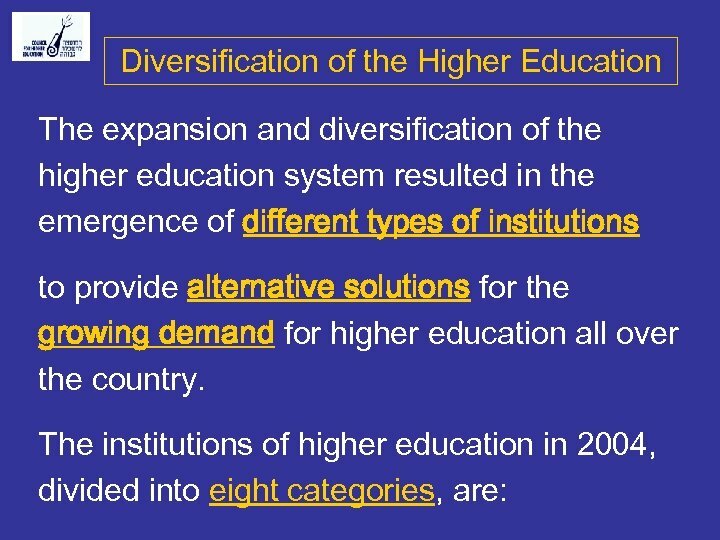 Institutions of higher education whose mission is to provide academic teaching at the highest possible level. 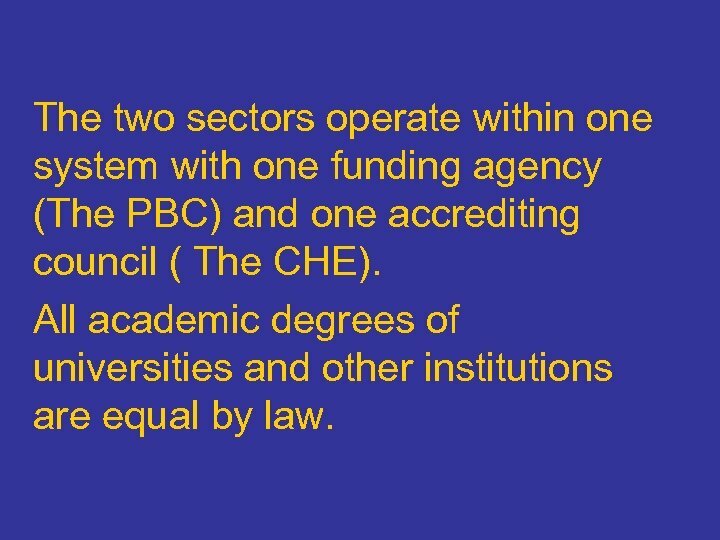 The two sectors operate within one system with one funding agency (The PBC) and one accrediting council ( The CHE). All academic degrees of universities and other institutions are equal by law. 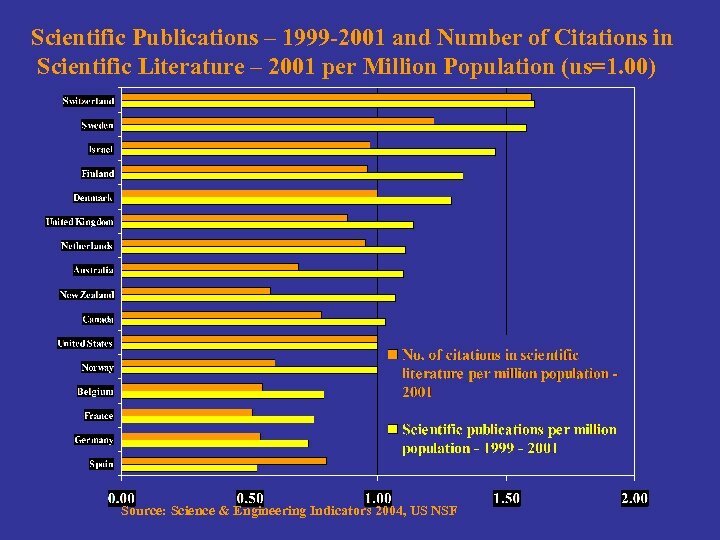 ROLE OF UNIVERSITIES * Research universities compete for scientific excellence at world level. * They have to prepare the next generation of scientists and the future academic staff. The Role Of Colleges UNIVERSAL ACCESS: *. The colleges should provide a place to anyone who can benefit from academic education. *. Colleges must promote diversity in institutions of higher education. 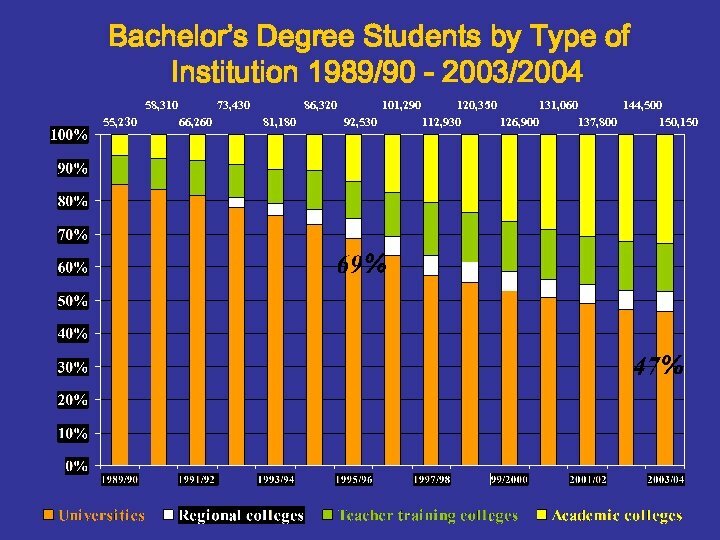 EXPANDING HIGHER EDUCATION * The colleges reach new groups in the population that were underrepresented in academic institutions. * The colleges are oriented to the labor market and teach employable skills. 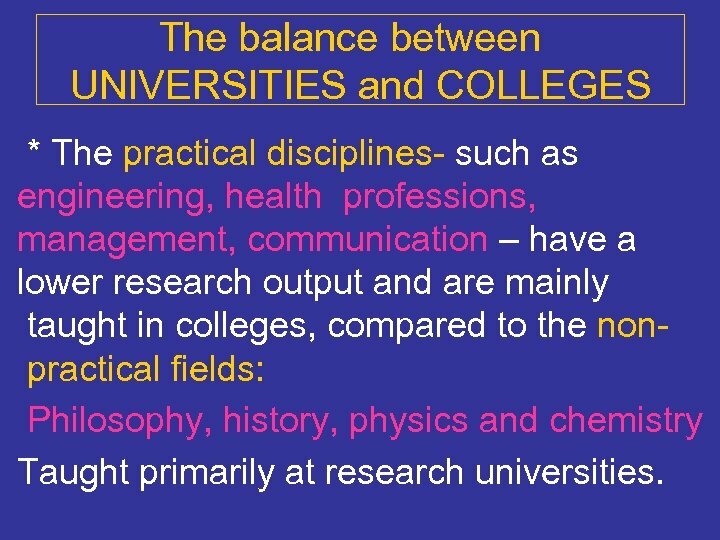 The balance between UNIVERSITIES and COLLEGES * The practical disciplines- such as engineering, health professions, management, communication – have a lower research output and are mainly taught in colleges, compared to the nonpractical fields: Philosophy, history, physics and chemistry Taught primarily at research universities. 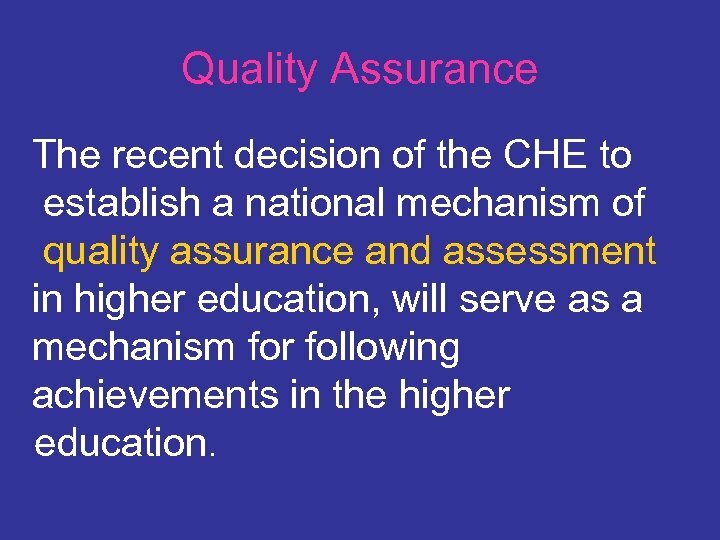 Quality Assurance The recent decision of the CHE to establish a national mechanism of quality assurance and assessment in higher education, will serve as a mechanism for following achievements in the higher education.